The soldiers and Officers of the Imperial Military will each have their own interests and loyalties. The Galactic Empire never had a chance. Dangerous to your Star Fleet Commander, not to this battle station… This station is now the ultimate power in the universe. I suggest we use it. In fact, our very first glimpse of the Imperial High Command is an argument between the Army and the Navy about the strategic vulnerability of the Death Star. The stakes are high: For the Navy, the Death Star represents the ultimate in bureaucratic power-grabs, a guarantee of perpetual dominance on top of the Imperial pecking order. For the Army, the Death Star represents the potential death of their service as a viable political force. This type of rivalry isn’t unique to the Empire—the argument between General Tagge and Admiral Motti isn’t even specific to the Death Star. In the aftermath of World War II and the dawn of the nuclear era, the newly formed US Air Force made a concentrated effort to become the foremost military service, arguing that between long-range bombers and nuclear weapons, there would be no further need for the Navy or Marine forces. Like Admiral Motti, they argued that any military problem could be solved by flying to the scene with the biggest weapon available and blowing the problem up – thus making the other services irrelevant. Inter-service and intra-service rivalries are just an expression of the office politics that plague every large organization. The way that those systems are designed determine the effect of those rivalries on the organization’s effectiveness. The high-stakes of Imperial rivalries and lack of checks and balances in the Empire’s political system ensures that petty personal and inter-service politics would have dramatic negative effects on the overall effectiveness of the Imperial military. This resulted in myopic strategic thinking, shoddy acquisitions and ineffective tactical operations that combined to doom the Empire. Nowhere is inter-service rivalry more apparent than in the lead up to the Invasion of Hoth in Empire Strikes Back. 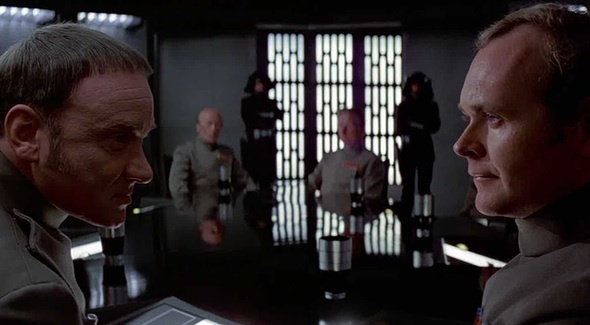 After coming out of light speed, an Army General reports to Vader that the Navy fleet has come out of light speed – a clear attempt to cut Admiral Ozzel off at the knees. Vader’s view of the situation is completely colored by the Army’s spin on the situation. Instead of allowing the Navy to give a report (and a possible justification for the strategy), the Admiral gets killed, the Army gets the glory, and CAPT Piett moves up a slot after learning a valuable lesson about the utility of throwing his Army colleagues under the bus. The US military isn’t necessarily different – individuals are still heavily motivated by their own ambitions and interests. 1-star Generals still want to be 2-star Generals, and Navy officers still have personal and professional incentives to skew things against the Army. That advancement, however, doesn’t carry the same weight as it does in the Imperial military. Becoming a Grand Moff in the Imperial Military means a governorship and dictatorial power over an entire planet—failure is punishable by a painful, public death. Getting on the Joint Chiefs of Staff means a hefty retirement check and a gateway into a cushy civilian job – failure is punishable by early retirement with a slightly smaller check and gateway into a slightly less-cushy civilian job. The stakes of Imperial inter-service rivalries are devastatingly high. Even more importantly, there are a variety of checks and balances inherent in the US system that prevents the worst effects of inter-service rivalry on mission accomplishment. The different branches debate their strategic priorities publicly with oversight by elected officials; an independent media can critique ill-conceived procurement plans; and public pressure in response to casualties force reforms of ineffective tactics and operations. The decision making process in the Empire is “efficient” in the sense that decisions can be made quickly, but utterly inefficient in the sense that it relies solely on the Emperor and his cronies to make perfect decisions 100% of the time. Because of the high stakes, the only objective of an Imperial Admiral or General is remaining in the Emperor’s good graces – and the lack of independent oversight means that their own mistakes will be covered up and rival services will be undercut whenever possible. This is not unique to the Galactic Empire. In World War II, the rivalries between the Imperial Japanese Army and Imperial Japanese Navy were so intense that they had a special name, “Gunbatsu.” At one point in in the 1930s, factions within the Army even tried to assassinate Admiral Yamamoto to prevent him from interfering with their plans for war (a feat which they later accomplished by having terrible, terrible, cryptography). In the United States, the decision making process is a multipolar system with extensive checks and balances. When the Air Force tried to establish long-term dominance over the Navy, Air Force Generals successfully convinced both the President and Secretary of Defense of their strategy. In the Empire, that would have been the end of the discussion. In the US however, the Navy fought back in the media, leading to the so-called “Revolt of the Admirals” and Congressional hearings on the future of military spending. When war broke out in Korea, nuclear weapons were never used due to a fear of public outcry and Soviet retaliation – and the Navy was still around to provide the crucial amphibious invasion at Inchon. Even a fully operational and non-vulnerable-to-proton-torpedo Death Star is not a sustainable plan for long-term governance. “Fear of this battle station” will not keep the systems in line – as Leia points out, “The harder you squeeze, the more systems will slip through your fingers.” Just like the Soviet Union found it couldn’t just nuke all of its problems away, rebellion would be a constant fact of life in an Empire dependent solely on the threat of planetary destruction. The Empire’s strategic thinking surrounding the Death Star is woefully inadequate. An excellent articles. I’m sure any well actually’s coming out of the Expanded Universe would not really be helpful – but might provoke an interesting discussion. 1 – The Stormtrooper Corps are a separate body from the Army and the Navy. So those guys in the AT-STs are Army, and the Navy maintains a few troopers (e.g. guarding the detention cell block), so the three main services of the Imperial Military were constantly having to work together. 2 – Grand Moffs seem to have authority over both the local (Sector) Naval and Army forces. It may be that there is also a Federal fleet. This may solve some problems of a clashing General and Admiral, but does add others if say Darth Vader, whose position in the Imperial Military is Supreme Commander, and has his own personal fleet The Death Squadron, decides to pass through a Moff’s sector. 3 – Although submission to the Emperor is usually the primary aim, there is at least one notable example of a Grand Admiral (similar in rank to Grand Moff but clearly naval only), who would make his own choices without deference to the Emperor but be forgiven for good results. I am unsure how often this has/does happen with American Admirals and the President. Given the USA is not the sole power, taking individual action in the Empire has less consequences for the stability of the Empire as a whole (ignoring, perhaps, Darth Vader’s obsession with his son). And be sure to marvel at the repeated usage of Comic Sans. As someone who works in DoD procurement, I can assure you that use of comic sans is both indicative, and the least, of the problems we all have with DAU (Defense Acquisition University). The Grand Poobah never laid out a backstory on how the various forces work. What are the IST’s? A Fast Action DRT? Far too many of them for that I would think. A personal army created by the Emperor parallel to the droid army that had to expand after the droids failed? And where do the officers come from? Are the Moffs former IST’s? Just the Generals? If no, that means the upper ranks are political ranks. Paperpushers not fighting generals. I can see why there’s so many problems if all your upper mgmt are made up of REMF’s. It certainly looks like there is, in fact, 3 forces. Navy, Army and the IST. On top of that there are subforces coming from somewhere. Vader’s probably from the Navy, the Legion an elite force from the IST ranks. Who controls what looks like a nightmare. Both were massive projects undertaken by the navy and meant to be the last word in naval firepower. Unfortunately they were both destroyed by small attack aircraft. Yes, but the failure of Pearl Harbor lead to their destruction. If the Pacific Carrier Fleet had been destroyed as planned both would have dominated all the naval powers for at least a couple of years. It’s interesting to speculate on how fast the US could have designed, laid the keels and built their first new carriers if the fleet had been destroyed. A year? 18 months? Probably faster than Japan figured on but still, having the IJN roaming free in the Pacific for 2 years is a nitemare. C’mon, OTI, can’t you find writers informed enough not to mix up measures of time and distance? We sent Ben about 20 parsecs of feedback on this article, and he got back to us 11 parsecs later with a response that reached 45 parsecs on our quality scale. So, we went the 2 parsecs over to our refrigerators, where we keep a half-parsec of milk and a parsec of grapes, and took our minds off it before parsecking to bed and grabbing 40 parsecs. This is a joke, referencing Han Solo’s own mixing up of the term when he refers to “making the Kessel run in less than 12 parsecs.” Since the movie, fans have written tortuous explanations (involving black holes and relativity) trying to explain away this gaffe, but don’t buy it: it’s bad writing in the script. What the hell is a Jiggawatt? All Things Considered (the Empire had a surprisingly robust public radio program). I too intended to make a joke about a parsec being a unit of disctance and not time, but chose to refrain for two reasons. First, knowing the author of this article personally, I am certain that he is already aware of that little nugget, and second, I have no doubt that 60 Parsecs was a play on both 60 Minutes and the amount of time it takes the Millenium Falcon to make the Kessel Run. Very interesting article though, and a great, if not unconvetional look, at issues within our own military forces. Oh, and on inter-service rivalries not analogises in the article, but relevant since round the table with Motti and Tagge was Yularen, is the Imperial Security Bureau and Imperial Intelligence – which are not divided by purpose so much as deliberately separate for checking and balance (perhaps akin to the two police services in Italy, which are set up as rivals to prevent them abusing their power). And then within II there’s the Inquisitorius who are tasked purely with hunting and turning Jedi. Imagine if there was a religious special interest group within the CIA, admittedly one favoured by the President (so in US politics ostensibly Christian) tasked with the elimination of a rival sect. That’s no doubt going to cause some tensions with people like Tarkin who don’t really see the Jedi/Sith conflict as relevant any more. Allow me to cut in? I’m curious as to where the technology is coming from here. We don’t see the owners of businesses pitching their new stuff onto the military of the Empire, but surely their weapons come from somewhere. I’m thinking of the scene in Iron Man 2 where Hammer is showing Rhodes all the things that could weaponize an Iron Man suit as a point of reference. Does the Empire have an R&D department that is an equal-opportunity provider to any military branch? Are the branches competing for the technology from the Empire itself? Or do the new weapons come from private corporations? Basically, I’m wondering if there’s any sort of Military-Industrial-Complex that’s also influencing the power relations and political structures. Actually, come to think of it, there is an answer in a small detail from the prequels, specifically Revenge of the Sith. The plans for the Death Star are seen briefly, and it is shown to be under construction at the very end. The weapons and other equipment used by the republic army are incredibly similar to those later used by the empire (you see proto-AT-ATs, etc), but in most cases less technologically advanced. This seems to suggest that there is NO new R&D going on, but simply production and maintenance of old systems, even the “brand new” superweapon that the navy is building. Which makes a certain amount of sense, given that the major technological firms were allied with the separatists in the clone wars, and thus were all unceremoniously murdered. Or, at any rate, their bosses were, and they would therefore be unwilling to work for the new empire. Thus, they’re stuck with old, shoddy designs like the various tie fighters, while the rebels get fancy new fighters every few years from renegade researchers. The little R&D that is done internally seems to lean towards the fantastical, the better to please the emperor. The Expanded Universe is littered with insane Imperial projects scattering the galaxy, from Sun Crushers to Dreadnoughts to horrifying biological weaponry. Due to the need to please THE EMBODIMENT OF EVIL, research has strayed from the practical (blasters that shoot straight) and more towards mad science. There are in fact a number of places where Imperial weapons and technology comes from. First, are the private corporations, like Kuat Drive Yards, the firm that took the government requirements and turned them into the Imperial Star Destroyer, won the contract with a very nice prototype, and then turned out the remainder in a hurry, cutting all possible corners to pocket the profit. Since a single ISD can cost 145 million credits per unit for the Block 2 design, that’s a lot of corners.Kuat sold it’s weapons to others as well-including the rebels who were using a Kuat V-150 Ion Cannon at Hoth. Unsurprisingly, the Rebels had procured one of Kuat’s best products to use against one of their…not so good ones. KDY actually was less corrupt than corporations like Seinar, manufacturers of the TIE fighter, who’s chief designer was a close personal friend of various Imperial big-wigs. The alternative was the various Imperial in-house development agencies, set up to tackle specific problems. Unfortunately, while often successful at their particular missions, they were very bad at information sharing. Imperial Intelligence had access to a super-spy satellite that could determine the positions of the electrons in a computer from Hyperspace! Yet this amazing sensor technology was unavailable to Darth Vader’s forces when they were looking for the Millennium Falcon. Similarly, the last few bugs were worked out of the Death Star’s plans at a facility so remote, so secret and isolated that they did not receive news of it’s destruction for 11 years. Last, of course, would be private industry and academia-who increasingly and persistently sided with the rebels! No, when they hand over the T-65 Space Superiority Fighter prototypes and all the tooling to an armed insurrection, you cannot trust private industry. Needless to say, Incom’s private development firms were nationalized and many heads flew after handing the X-wing over to the Rebellion. There are two categories of private industry here, obviously. Those in bed with Imperial authorities, swimming in a sea of bribes, neopitism, and corruption, and those who still cling to an outmoded system from before the fall of the Republic. Is this in the movies or the expanded universe? I’m not doubting you, just curious where you got so much detail. Mostly Expanded Universe – and there are a variety of industries but it does seem they mostly fall on one side or other of the war (somehow, given the Rebels are constantly on the run). Kuat Drive Yards, Sienar Fleet Systems, Cygnus Space Works all serve the Empire, Incom (who after nationalisation are a spent force), SoroSuub, Mon Calamari the Rebellion but the Rebellion ends up with KDY stuff that’s already out there back when the corrupt Republic was letting arms deals go on all over the place. I am only familiar with the original trilogy and prequels, so can’t comment on how all this fits into the EU stuff. I made some extrapolations about the economy of the Empire based on the fact that in Return of the Jedi it’s obvious that the construction of the Death Star is being overseen by a military officer – not a private contracter. My assumption is that the economy would look very similar to the IJN or the present-day People’s Liberation Army in China, where military officers actually own and operate the vast majority of defense factories, and each have their own “Empires” to protect. Regardless of the administrative makeup, I charge that ANY massive government spending program is going to at the very least ATTRACT rent-seeking profiteers – the only sure cure is an independent body seeking out corruption (i.e. an independent press and responsive people). Ah-HAH, I love this idea of mini-empires vying for control within the overarching political structure of the Empire itself! That opens up a plethora of fun possibilities, like a crazy general going rogue ala Radchenko (the Russian ultranationalist) in Crimson Tide and stealing a Death Star or something! I would argue that Vader knew exactly what was going on but allowed it and even provoked it because of the anarchy that it creates. That’s a good point. The Sith revel in chaos. It doesn’t matter who is running around in disarray as long as someone is. Another thing about the tech, there’s a ton of alien races in the Empire. I doubt that the Empire can control all of them and each will have their own tech base. If you’re not wedded to interoperability between units then you could amass a lot of interesting designs. Sorry, but now I have a picture in my head of Darth Vader bouncing up and down going “Amok! Amok! Amok!” like the witch in that Disney Halloween movie. On storm troopers not shooting straight (and a couple of other alleged failures of the Imperial military), it should be noted that in “A New Hope” there was a deliberate plan to let Leia, Han, and Luke get away in order to track them to the rebel base, so storm troopers on the death star presumably missed because they were ordered to. In “Empire Strikes Back,” they’re accurate enough to defeat the rebel defenders of Hoth. Only in “Return of the Jedi” do Imperial troops utterly humiliate themselves. Hey, remember those four TIE fighters that chase the Falcon in “A New Hope”? Are they under strict orders to die? That’s pretty messed up, man. They’re just clones, after all. Just want to clarify something here — the 1986 Goldwater-Nichols Act came about because of the failure to coordinate operations during the 1983 invasion of Grenada, not Panama. Panama, the invasion of which was to capture Manuel Noriega, occurred in 1989. And to agree with Ben, while the U.S. military’s Acquisition process is Byzantine, what it does allow is for quality checks at numerous points in the process, and opportunities to upgrade technology beyond what was initially planned, prior to the equipment’s IOC (initial operating capability). There are some recent very prominent counter-examples to that: the Joint Strike Fighter, the F-22, the Littoral Combat Ship. In all these cases, multi-tens-of-billions-of-dollars programs demonstrated fundamental flaws (such as structural cracking, suffocating pilots, or rapid corroding) well into the main production of the weapon system. Quality checks are only effective if there are parties that gain from preventing problems. I’d argue that in the current acquisition process, there are so many people with interests in seeing the programs funded (contractors, pork-barrel congresspersons, military leaders interested in prestigious toys) that there really isn’t a good checks-and-balances system in place. Few people win if a multi-billion dollar program is cancelled, and there are practically no consequences for being ill-designed and over-budget, so programs take on a life of their own. This is especially true when such weapons are so expensive to use that they are rarely fielded, and thus there are no real combat losses due to poor quality. For example, although the F-22 has been the primary US fighter plane since deployment in 2005, it has never flown a single combat mission, despite US involvement in two major wars and several smaller conflicts (e.g., Libya). If it doesn’t actually matter how weapons perform in combat, there is little pressure to have them function properly. And to bring it around to Star Wars, as Tarkin says, “Fear will keep the local systems in line. Fear of this battlestation.” Note the key word there, “fear”. In other words, the Death Star doesn’t really even have to work, as long as people think it does. If the populace is cowed, and you never really have to fire your weapons, you don’t have to worry about quality. My response to your argument re: LCS and the F-22 is simply this – the fact that you are able to critique those programs on Overthinkingit.com proves how valuable a free and independent press is in the enforcement of checks and balances. Both programs have been substantially altered/reduced/investigated due in large part to public pressure. Do you think that if the Empire were building the LCS and F-22, you would even KNOW about the problems, much less be in a position to critique them? (Lest it become suspected that I am an LCS-sympathizer, that program is a boondoggle, but still – we KNOW it’s a boondoggle and can debate the best way to fix it). I’d certainly agree that the US process is better than that of a galactic dictatorship. But I’d argue it’s not nearly as good as one might naively expect from a free market democracy. Dan – That’s a solid “Well Actually”, Goldwater-Nichols was definitely in response to Granada, not Panama. And yeah, criticizing the acquisitions process is hard without getting really down into the weeds is tough – it’s extremely difficult to come up with a process that is responsive, effective, cheap and not susceptible to corruption. That’s not to say it can’t be improved, just that it’s a much, much harder to fix than most people appreciate. Obviously, the advantages of a free market democracy are difficult to apply to military procurement. To get the full benefit of the free market, military supplies must be freely traded, but in order to give their military the advantage, countries try to restrict their best weapons to themselves. Democratic oversight requires people to know what’s going on, but publicizing the details of highly advanced military technology makes it easier for potential enemies to find weaknesses or to copy it. I doubt there’s any way to eliminate those problems, though I do tend to think that the costs of secrecy in enabling corruption and covering up incompetence are usually greatly underestimated, so that we’d probably be better off in many cases (though presumably not all) if we sacrificed some secrecy in order to get more effective oversight. But in many cases the problems of the weapons systems haven’t been all that secret (see the examples above), and yet they still continue to produce them. That said, I do agree that there are some deep systemic issues that prevent efficiency. For example, as you note, it is impractical for a superpower to purchase its advanced weapons on the true free market. Even with competitions among potential suppliers to provide some of the free market efficiency, there is a huge financial cost to developing multiple systems for the same role, which means that the military ends up committed to a single system very early in its development, regardless of its problems (arguably this is why the US is stuck with the Joint Strike Fighter). Also, there is the practical issue of keeping a potential military industrial supplier afloat, and preserving its industrial capacity, if it is not currently producing weapons (since large weapons systems production, over their life, become like a monopoly). These are not problems of corruption or evil intent, but they certainly push the system towards single-sourced weapons systems, committed to early, and intentionally alternated among a few large suppliers, which even in the most ideal governance model is hardly a picture of efficiency and quality. Layer on top of that senators anxious to support their state economies with Pentagon dollars, generals and admirals intent on supporting their own importance with the latest and greatest toys, and contractors with huge lobbying budgets), and it is no surprise that the US often has quality issues with its large weapons programs. *Everyone* has quality issues with everything associated with supply during peacetime. Only during wartime due you have impetus. No time for adjustments and project creep and you get instant feedback with live field testing. During peacetime everyone wants a piece, project creep is everywhere and pernicous and potentially fatal flaws can either be hidden or just undiscovered until too late. See Patriot Missle System. It’s endemic and I can’t see it to be anything but unavoidable. You can’t compare politcal systems during wartime. They, as such, do not exist. Everything becomes a command economy as the war effort has very different needs than anything during peacetime. The biggest difference between all the different countries during WWII is whether they were actively being fought in their countries or were outside the theatres. North and South America were fortunate to be largely untouched and were able to contribute much more effectively on a supply basis than the countries under bombardment. That doesn’t speak to any political system good or bad. Yeah Ben, sorry to pull a “well actually” on you. Didn’t mean it like that. As for Tulse, you are absolutely right about the F-22 and the LCS. The only reason I brought up the ACQ process was in contrast to the Empire’s. Let’s take a look at the second Death Star. It was clearly incomplete and rushed into operational service well before the actual contract date. Want to tell me there was absolutely no pencil-whipping on what systems were actually working when? Especially when the operational date was moved up due to Lord Vader’s visit? Yes, yes, Lord Vader is a telepath, and this is why you hotwire the green tell-tale lights, tell Ensign Newbie that all is well, and then go on leave for Grandma’s funeral *quickly*. Lord Vader does the walk-through inspection, checks out Ensign Newbie, who is certain everything is up to spec, and moves on to the next workstation.